Views in and around Copenhagen. Left: Søndermarken Park and Frederiksberg Have. 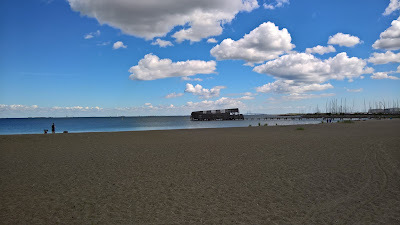 Center left: Kastrup Sea Baths. 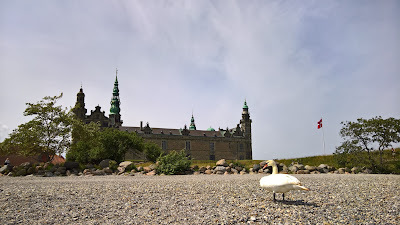 Center right: Kronborg Slot. Right: View of the The Lakes of Copenhagen. Okay the title sounds sensationalist, but it’s true. 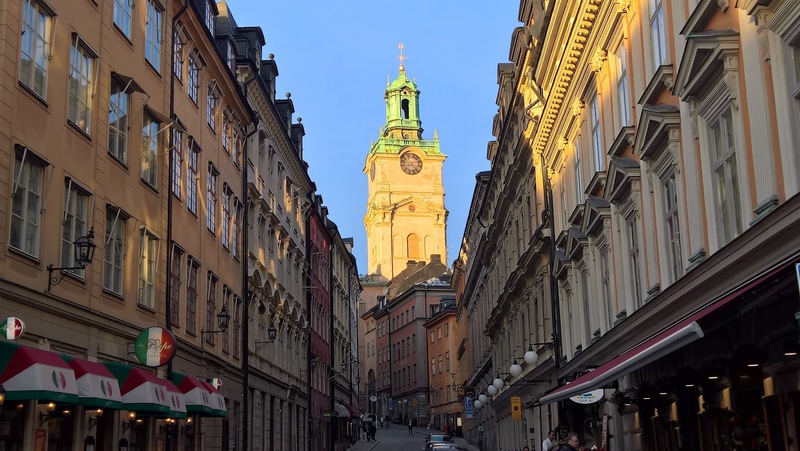 We visited Copenhagen for 5 days followed by 5 days in Stockholm and we really did walk 100 miles as reported by the step counters on our phones. In Copenhagen, we made good use of the metro system and still racked up over 50 miles. 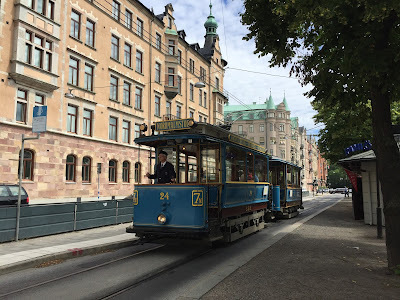 In Stockholm, we used the metro sparingly and hit just under 50 miles on foot. The take-away message is that these two cities are very walkable and you should pack good shoes. 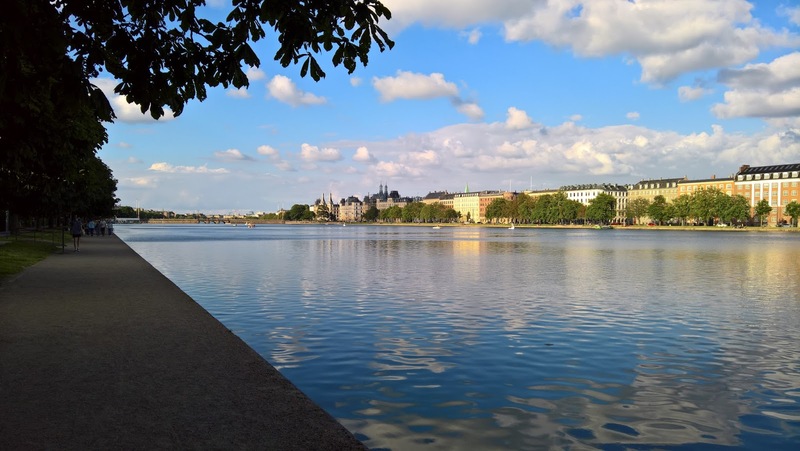 In this post, we’ll talk about what we did in these two cities that racked up so many steps. Fact and fantasy are strange bedfellows in how they combine to inspire us to visit a place. For Copenhagen, my inspirations were rooted in a 1951 photo of my Dad in front of The Little Mermaid Statue and the Scott Walker song “Copenhagen”. In the 1955 photo, my Dad is on leave for a few weeks from his army post in Landstuhl Germany, on a whirlwind tour of Europe including Copenhagen. I remember his tour well because in 2011 I spend hours scanning the slides from the photos he took. When I asked my Dad about that time, he said he had dropped out of Bryant College in 1954 due to too much “drinking and screwing around”. He didn’t want to go home so he volunteered for the army, which resulted a stint in New Jersey and then Germany. 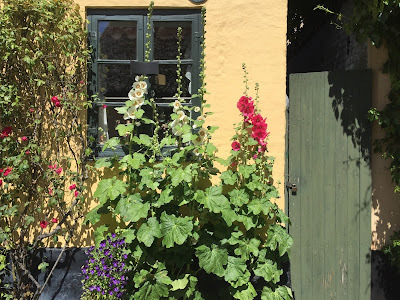 In Copenhagen, my Dad visited many of the things we did (see itinerary below) including Tivoli Gardens, Rundetaarn, Amalborg, and the Little Mermaid Statue. It was the statue however that stuck in my mind. It was one of the few photos that my Dad was actually in, a skinny 20-year old with big ears, wearing a brown tweed coat. The fantasy part of the inspiration? Maybe I would get to know my Dad better by visiting the same places he did. It would some how makes us closer in a relationship that, by my account, has always been distant. 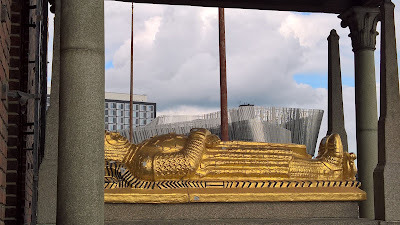 Add to the fact and fantasy a dollop of Scott Walker, in particular, his baroque pop chanson “Copenhagen” from his 1969 Scott 3 album, and that was a good reason to visit Copenhagen. The inspiration for Stockholm were also a bit of fact and fantasy. 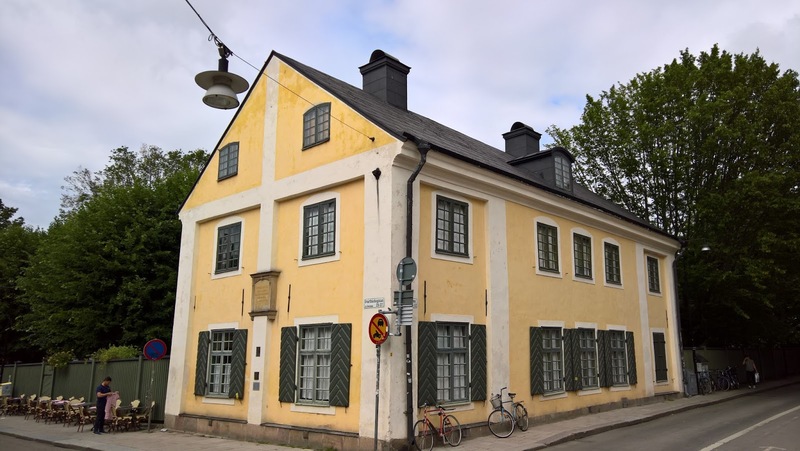 The father of modern taxonomy, Carl Linnaeus (1707 – 1778), lived and worked the better part of his life in Uppsala, just north of Stockholm. I’ve always been interested in people like Linnaeus who order things, especially plants. Therefore, a visit to Stockholm would surely include a visit to Uppsala. Views of Stockholm. 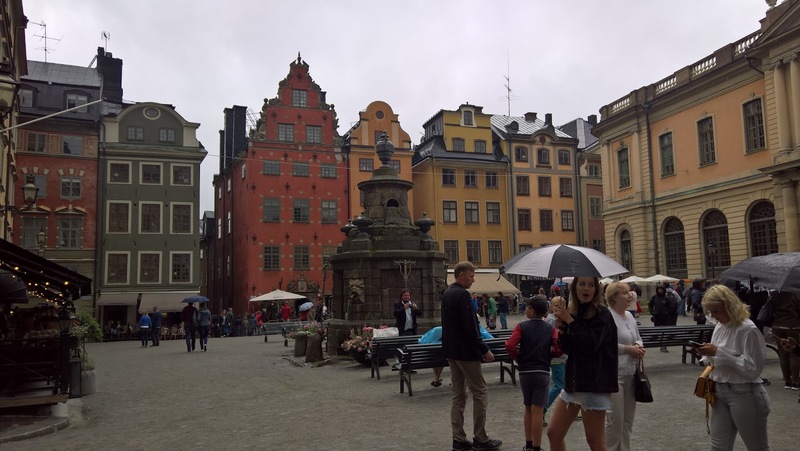 Left: Stortorget square in Gamla Stan. 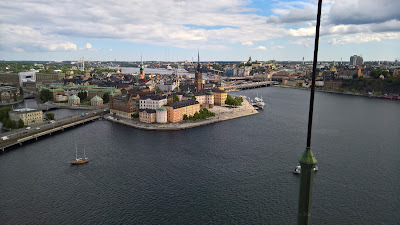 Center left: View from City Hall Tower to Riddarholmen. Center right: View toward Riddarhuset. Right: View up Storkyrkobrinken toward Storkyrkan. Also to mention as part of my inspiration for visiting both these cities is a World Happiness Report that caught my eye a few years ago. It reveals that the happiest nations are concentrated in Northern Europe. In the 2017 report, Denmark was ranked #2 and Sweden #10. (For reference, in the same report the USA is ranked #14 and Italy #48.) Notwithstanding Denmark being ranked higher, I still had Sweden in my mind as the prototype Nordic happy country and I was interested in visiting to see with my own eyes. I admit, 5 days does not give you much of a view of a city let alone a culture, but I believe when you move between different countries and cultures, it’s important to capture your first impressions and reflect on them before they fade from your mind and what you noted quickly becomes the norm. With that, here are some first impressions about Copenhagen. Christiania. Freetown Christiania was a disappointment. I read that it is discouraged from taking pictures in the main area and we didn’t. With so much interesting graffiti, it was a bit of a letdown. More generally, the area didn’t seem that interesting to us. Parks. Copenhagen has well-maintained and beautiful parks. And, they are well used and appreciated judging by the number of people we saw walking and relaxing in them. 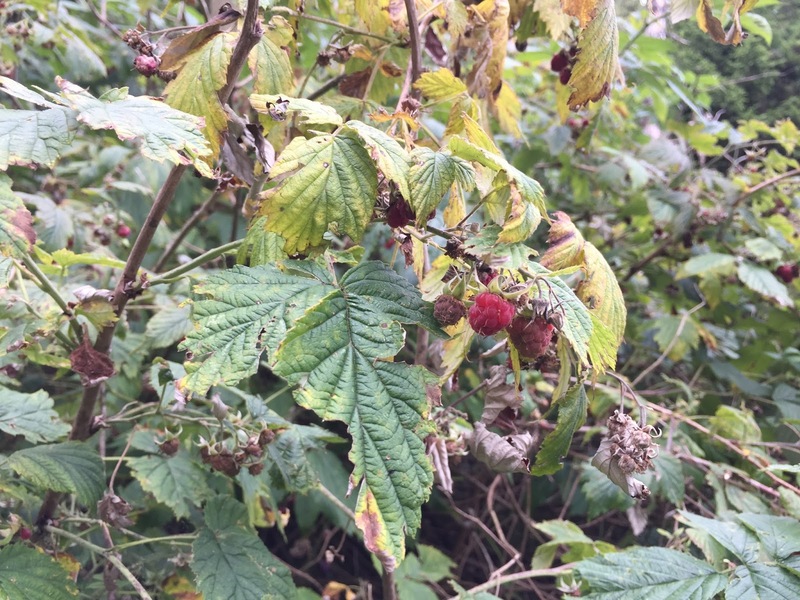 Make sure to stop by the free Botanical Gardens. Bikes. What a biking culture and supporting infrastructure in Copenhagen! No wonder they call Copenhagen the biking capital of the world. Advice: make sure you understand there are bike lanes and walking lanes. When walking, stay in the walking lane. In particular, when waiting for a light to change to cross a street, make sure you are not standing in a bike line, which is easy to do. Coffee. 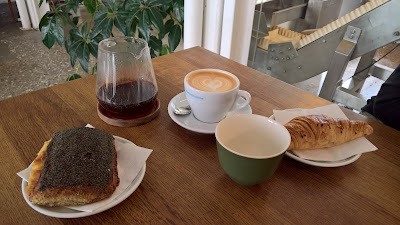 We found a great and vibrant coffee culture in Copenhagen. Our favorite place was Coffee Collective. We tried two of their locations: Coffee Collective at Torvehallerne and Godthåbsvej (torrefazione). Canal tour. Everyone said to do the canal tour. We broke down and did it on our last day in Copenhagen. It was okay, but nothing to rave about. While true that some buildings look great from the water, much of the scenery the canal tour shows you can be equally enjoyed on foot. If you do the canal tour, sit on the right side of the boat, up front. It seemed like we were always looking right (we sat on the left) and trying to look around people who were standing in front of us (we sat in back). Food. Sure, it can be a bit expensive to eat in Copenhagen, but the good news is that there are lots of relatively low-cost options that are also tasty. We loved the variety of food options we found in Copenhagen. Two food-related things that we did are: visit the Copenhagen Street Food (Papirøen) and take the Foods of Copenhagen Tour. Copenhagen Street Food is a fun space with lots of food choices. The Foods of Copenhagen tour was worth it considering the amount and types of food we ate as well as providing us with an introduction to different food scenes in Copenhagen. Views of Copenhagen. 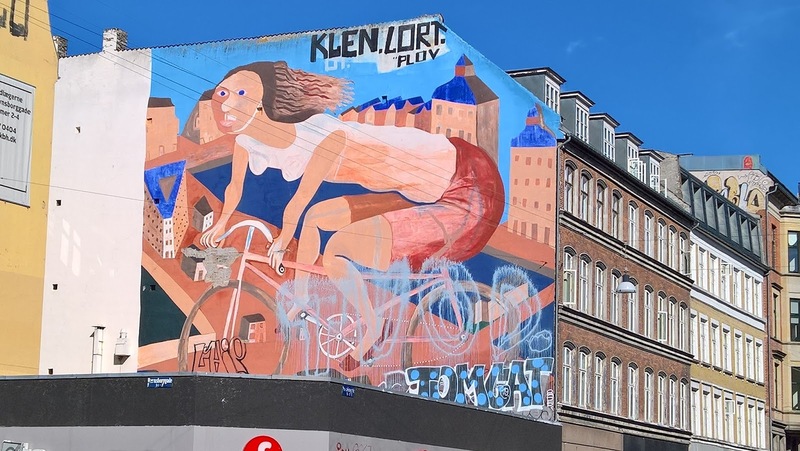 Left: Copenhagen Biking Mural on Nørrebrogade. 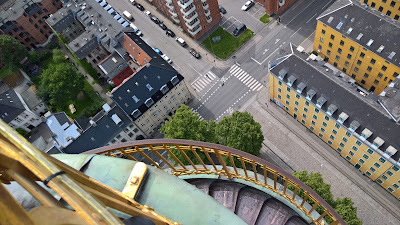 Center left: View from Church of Our Saviour (Vor Frelsers Kirke). Center right: View of Nyhavn. Right: Breakfast at Coffee Collective at Godthåbsvej. 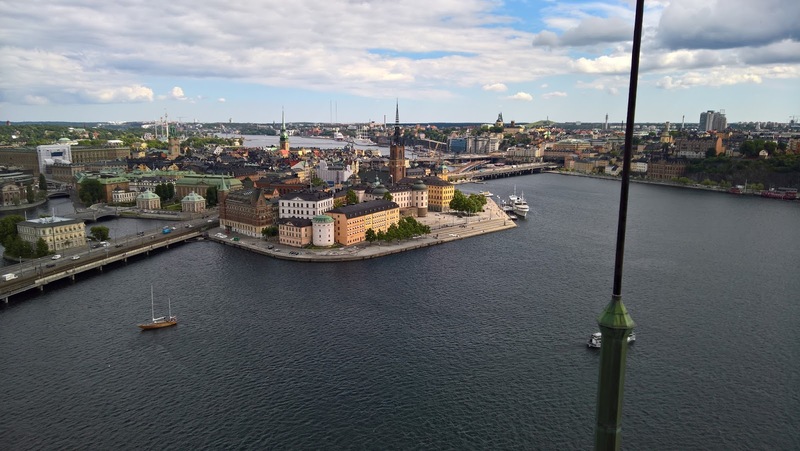 Here are some first impressions about Stockholm. Cash. After our lesson in Copenhagen on the usefulness of cash, we went cashless in Stockholm for the 5 days and were fine. There were two aspects of not having cash on hand to consider. First, when you get asked for money or you want to give something to a street performer, you’ll have nothing to give. This could be considered positive or negative. Second, you might need some coins to get into a bathroom. 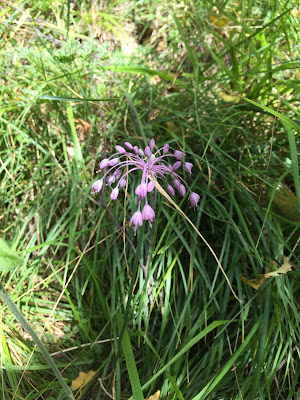 Most of the bathrooms around Stockholm seemed freely accessible, however, we did find in the middle (of the woods) of Kungliga Djurgården (The Royal Game Park) there were only pay toilets. Not having money, we took cover in the game park. My apologies to the royal family. Beggars. In Copenhagen, we didn’t get asked for money once. In Stockholm, we got asked a lot. According to the report Sweden: A Beggar on Every Corner, there has been a huge influx of Romani people (gypsies) from Romania and Bulgaria who are begging in Stockholm. We never felt threatened or put off, just surprised to find this to be the case. Free water. Such a petty point, but here it goes: I don’t like restaurants or cafés that make you pay for water. In Sweden, it was so nice to pretty much always find “free” water in cafés and restaurants. 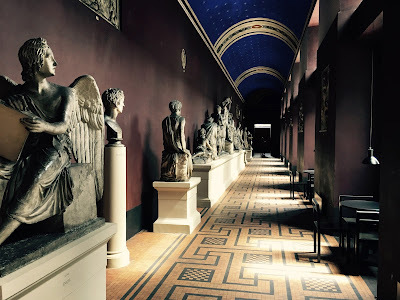 Free tours in museums. In museums, we went on a number of free tours that seemed to be normal practice in Stockholm. 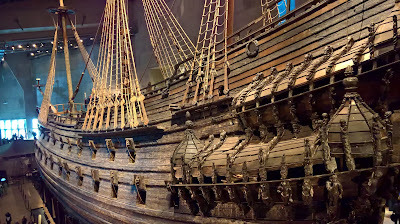 In particular, we had very good, free tours in the Nobel and the Vasa Museum. And, the tours are in multiple languages. For example, we took an English tour in the Nobel Museum and an Italian tour in the Vasa Museum. Fashion: One knock against the Swedes, in particular Swedish business men, is that we saw some shockingly ill-fitting suits with high-water pants, pant wedgies in their backsides, and one button straining to hold the jacket together over stomachs. Of other Swedes on the street going about their everyday business, black and white were the colors of choice. I say this because we definitely felt like “just visiting” was plastered to our back in our shades of blue we are accustomed to wearing. Coffee. We found a healthy coffee culture in Stockholm. Our favorite was Kaferang, but there are many to choose from. Second-hand Shops. We noted a lot of second-hand shops in Stockholm, but then again, we were staying in the hipster Södermalm neighborhood, just south of Gamla Stan, so maybe that has something to do with it. 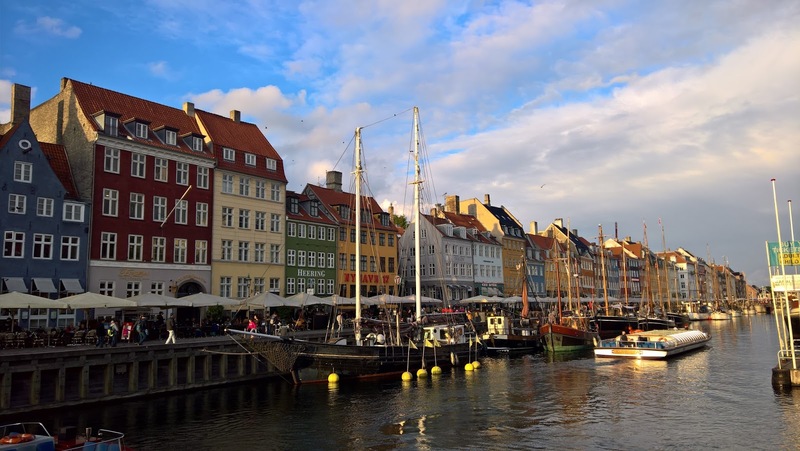 Overall, we’d say that Copenhagen won out slightly over Stockholm in these categories: cleanliness, the scale of buildings in relation to people (i.e., buildings don't dwarf people on the street), and how people looked and dressed. 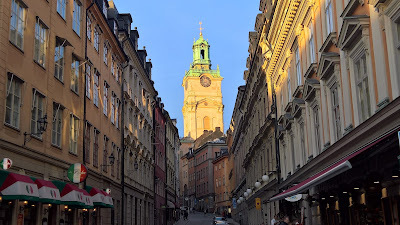 The following were about the same between the two cities: vitality of street life, and a funky-vintage feeling, with Copenhagen having a 70s feel and Stockholm a 50/60s feel. Finally, in summer, you will definitely notice the length of daylight in both these cities. We certainly did. For the 10th of July, for example, there is over 17 hours of daylight in Copenhagen with sunrise at 04:40 and sunset at 21:49. For the same day in Sweden, there is 18 hours of daylight, with sunrise at 03:49 and sunset at 21:56. Views of Stockholm and Uppsala. Left: Cenotaph of Birger Jarl. 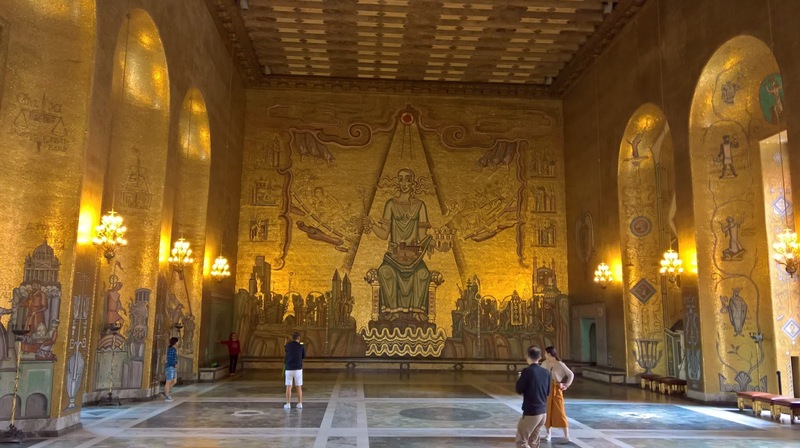 Center left: The Golden Hall in Stockholm City Hall. Center right: Linnaeus Museum House in Uppsala. 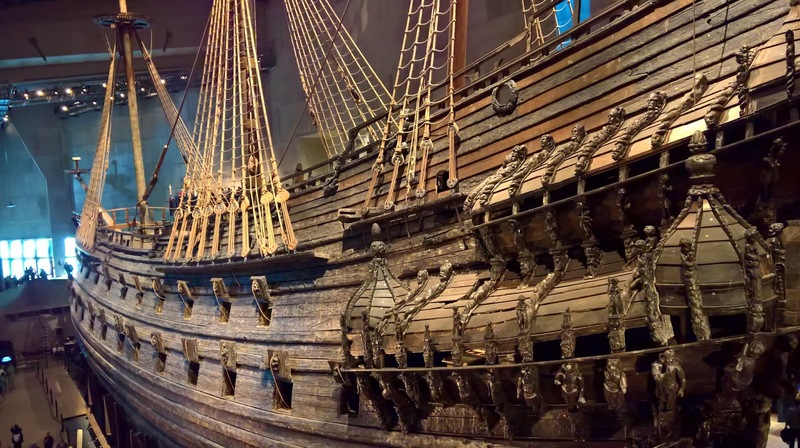 Right: The Impressive Vasa. 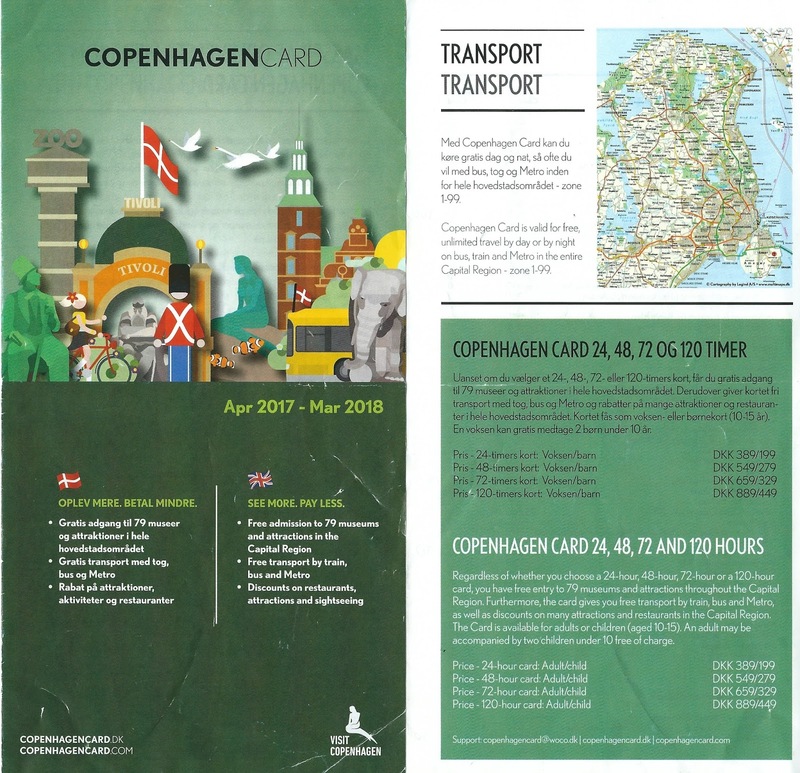 We purchased the 3-day Copenhagen Card and didn’t buy the Stockholm pass. We think we came out ahead in both cases, but your mileage may vary. To get the most out of the cards you have to pack a lot in your days and choose your venues carefully. One thing to keep in mind is that the card goes into effect the first time you use it, so you could, for example, get a 3-day pass and activate it a day or so later. For example, we activated our cards late Tuesday afternoon so that our 72 hours ran out on Friday afternoon just as we were leaving. 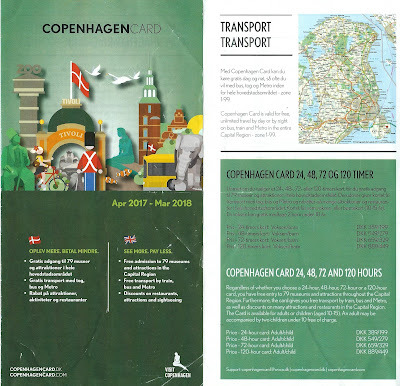 In Copenhagen, we bought the card at the tourist office near the main train station. It was the first thing we did upon arriving. 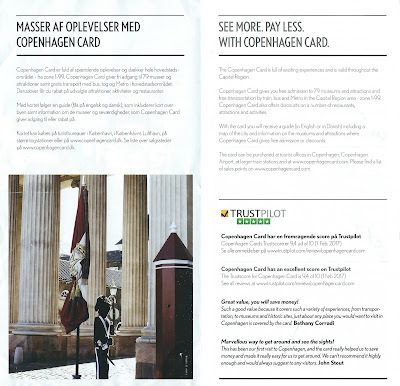 Here’s an example of how we used the 3-day Copenhagen card. 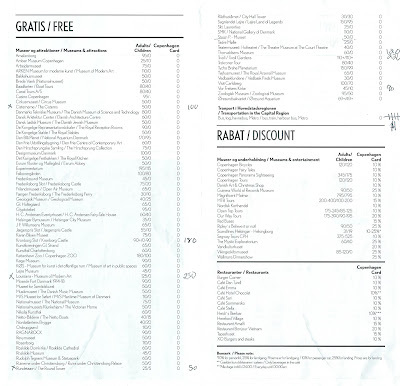 It cost, at the time of purchase, 659 DKK (Danish Krone) for one person, 1318 DKK for the two of us or about 206 USD (US Dollar). 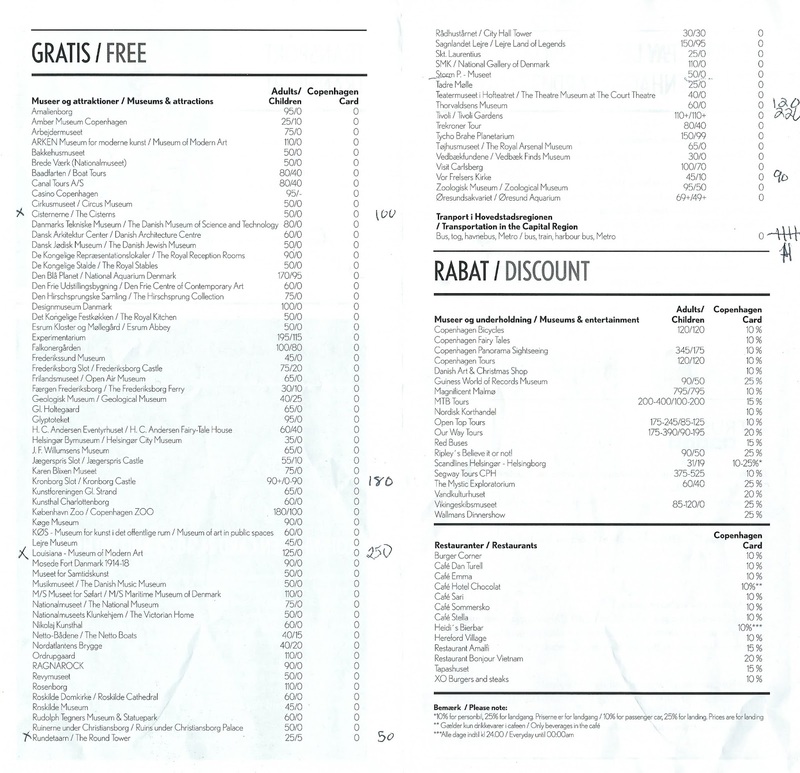 The costs given below are for two people. 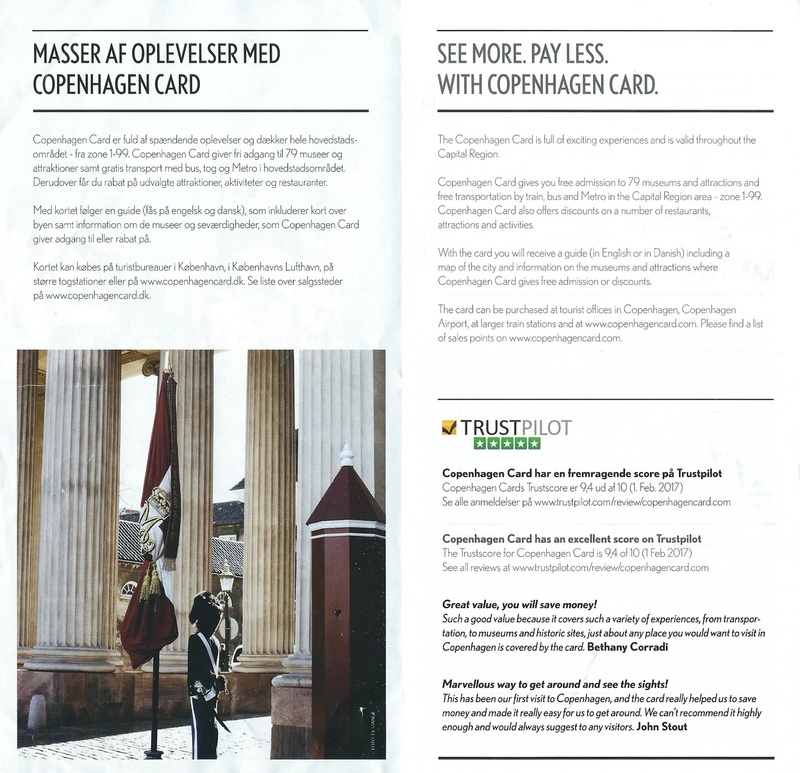 Buy Copenhagen card. Explore the city on foot. No paid entrances. Bike ride around Amager Island, not covered by card. Food tour not covered by card. * We took the Copenhagen metro 8 times. A single zone ticket was 24 DKK (at time of travel) so that’s about 192 DKK total. Therefore, 50 + 100 + 220 + 180 + 250 + 430 + 160 + 90 + 120 + 220 + 192 = 2012 DKK and is what we would have paid without the cards. Given that the cost of the card for two was 1318 DKK, we made out okay. 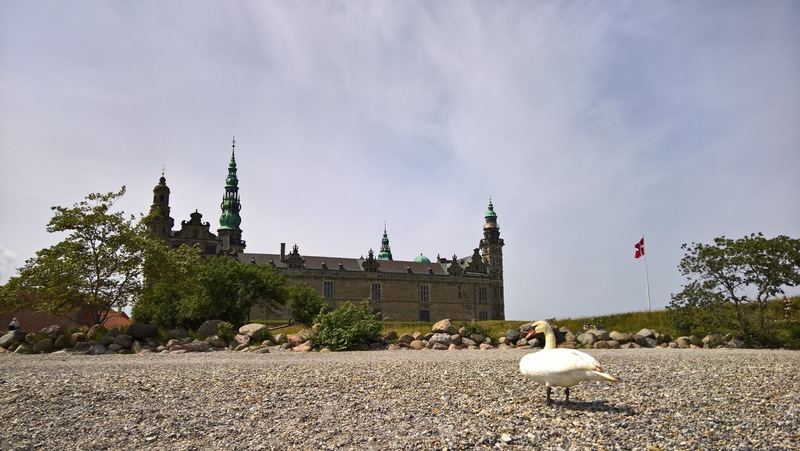 Going north to visit Kronborg Castle and Louisiana Museum, including train tickets, was a big factor helping us out get the most out of the card. Even though we were in Copenhagen for 5 days, we decided against the 5-day pass, which would have been 2 x 889 = 1778 DKK. 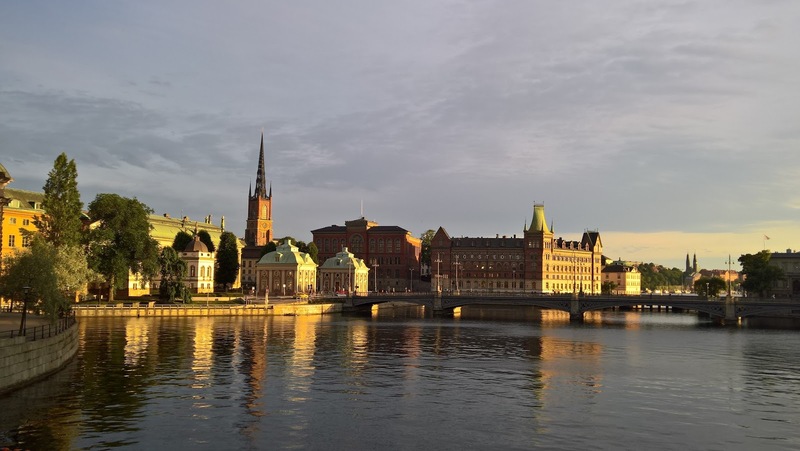 Our itinerary can give you an idea of what you can pack into a visit to Copenhagen in 5 days or Stockholm in 5 days. On this trip, we shied away from attractions that had “royal” or “palace” in their titles because we’ve seen a lot of similar attractions being based in Italy. Arrive early afternoon from Hamburg. Check in to Wakeup Copenhagen, Borgergade. Oh my, what a tiny room! Walk to The Little Mermaid statue passing by Amalienborg palace and the harbor. Recreate same position my Dad had in his 1954 pose. Visit the nearby star fortress, Kastellet. Walk back to city center and to Papirøen for dinner at Copenhagen Street Food. Hip and interesting with lots of food choices. Easy walk from center. Morning coffee at Coffee Collective @ Torvehallerne. This location is located in an interesting food hall/market. Bike ride. Rentals from hotel. 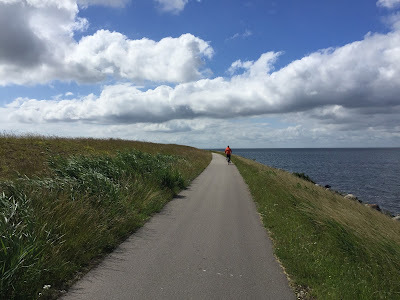 About 40 km, counter-clockwise around Amager Island. Lunch in Dragør @ Dragør Røgeri fish market. Order at the counter and eat on picnic benches outdoors. The Cisterns and visit parks Søndermarken Park and Frederiksberg Have. Dinner @ Jeppe’s hot dog. Sometimes you just feel like a hot dog. This location is also a torrefazione. Free to enter. Very well maintained. A wonderful tour that we recommend. Here’s a couple of places we visited: Café Gammeltorv, Skt. Peder's Bageri, Ostetorvet @ Torvehallerne, Brus Food, Assistens Kirkegård, Istid, ro Chokolade, Grød, Mikkeller & Friends, Koelschip. It's really worth it to take the tour and have the guides explain what you are eating and the backstories. We napped on the lawn. Serviceable Thai food, not the best we’ve had. 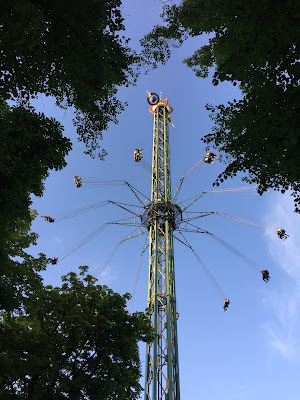 You pay to enter (or use the Copenhagen card) and then you pay as well to go on rides. Views in and around Copenhagen. Left: Bike ride around Amager Island. 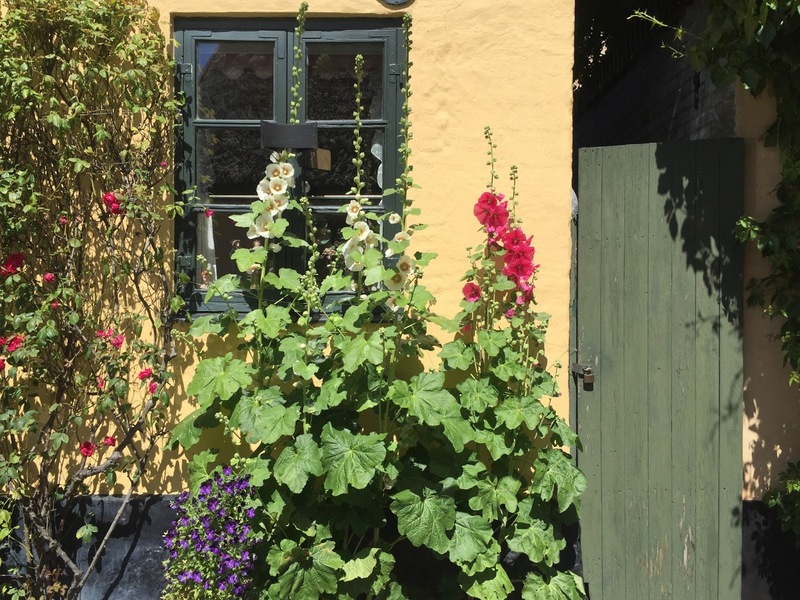 Center left: House and hollyhocks in Dragør. Center right: Corridor in the Thorvaldsens Museum. Right: Tivoli Garden Star Flyer. Train north to Kronborg Castle. Lunch @ Krone B on the castle grounds. 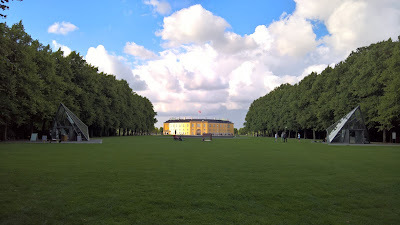 A museum with an interesting permanent collection and rotating exhibitions set in gardens with a view of Øresund Sound. During our visit, the current exhibitions were “The Cleaner” dealing with the work of Maria Abramović, the often-described “grandmother of performance art” and “Academy of Tal R” dealing with the works of Danish artist Tal R.
Buffet option was good with great views over the sound. Can you tell we liked this place? One of the conditions of using the Copenhagen card for the canal tour is that we could only board at Ved Stranden. Check the conditions of the card when you purchase it. Only one of us made up the staircase on the outside of the spire. 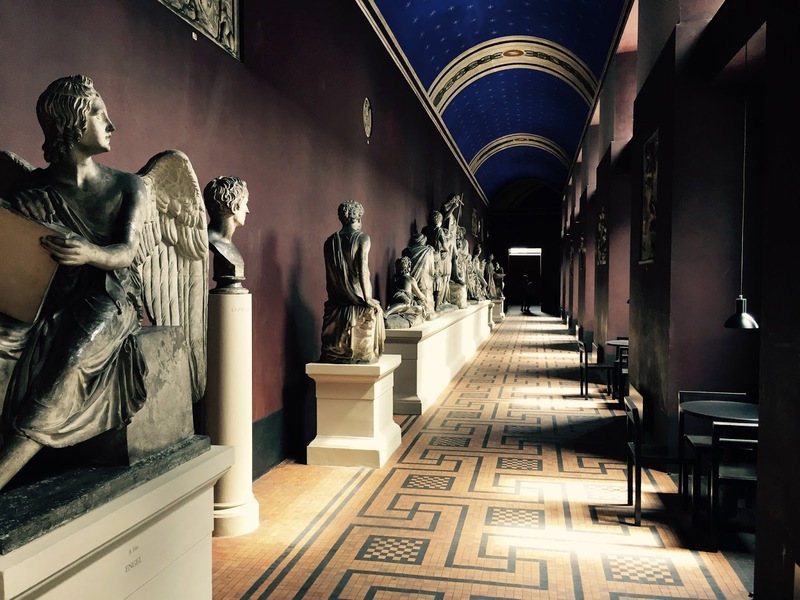 An interesting museum dedicated to the work of the Danish sculptor Bertel Thorvaldsen (1770 – 1844). Excellent. One of the best meals we had in Copenhagen. Depart for airport in evening for Stockholm. Very interesting museum. Make sure to get on one of the frequent free tours in various languages. Good quality / price ratio and did I mention the FREE water. One of the few free museums with an interesting collection. So-so. Ran out of guacamole!? No entiendo. Visit the The Swedish Museum of Photography (Fotografiska). We caught some interesting exhibitions here, and in general were very impressed with this museum. It’s open late too. At first, I thought this museum would be kind of dry, but it turned out to be very interesting. You can pick and choose which Nobel prize winners or areas you want to focus on. Be sure to take one of the regularly-announced free tours, which really helped orient us and appreciate the Nobel Prize. Dinner @ Indio Kitchen. Fusion Peruvian/Japanese. Very good. Second best meal while in Stockholm. 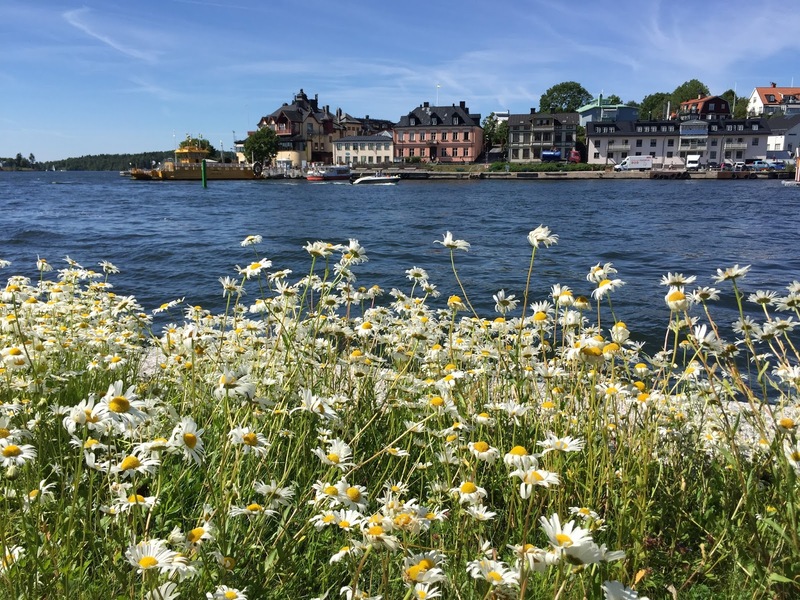 There are a bewildering number of choices for visiting Stockholm’s archipelago. We wanted to go as far out as we could for the day (e.g., Sandhamn) but then we were looking at a 2-3-hour boat ride each way. We concluded that it makes sense to visit a distant island only if you plan on staying the night or are willing to spend a very long day. It's true, that part of the allure of getting to the final destination is staring at the passing scenery from the boat. In the end, we went for the classic day trip from Stockholm to Vaxholm. With that choice, there are many transportation options, including bus. We went to Vaxholm with Stromma in the mode they call “the archipelago on your own”, which means you don’t get a guided tour while on the boat, and you go on a boat without a sit-down lunch. The ticket is cheaper and the boat is faster. This was a good option for because we planned to to walk and eat when you reach Vaxholm. Take a foot ferry to reach the small island on which the fortress sits. The museum is all about how the island and fortress played a role in defending Sweden at various times in history. This café is a bustling place popular for its selection of sweets. We ate lunch and something sweet and were very satisfied. The café is not far from where the ferry docks in Vaxholm. This is a sprawling park in the center of Stockholm. 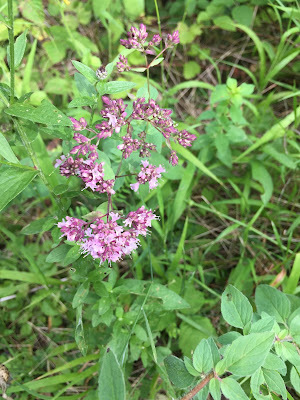 You visit the park on foot or bike. 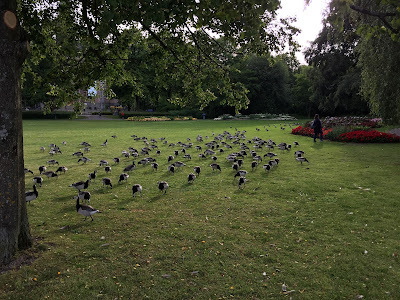 Left: Barnacle geese in the The Royal Game Park in Stockholm. Center: A trolley on Strandvägen in Stockholm. Right: View from Vaxholm Fortress back to main town. A dream fulfilled. 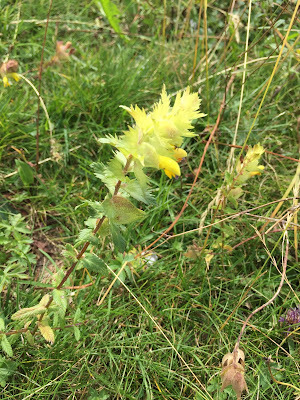 For more information, see the Travelmarx post A Visit to the Linnaeus Garden in Uppsala Sweden. Lunch @ Shawarma street food truck in Uppsala. Like hot dogs, we get a hankering every so often for good shawarma. Many museums close early in Sweden – it seems – and on our first visit to Moderna Museet we missed parts of the museum and so decided to come back. Make sure you take a look outside the museum (south of the building) at the colorful and interesting Niki de Saint Phalle and Jon Tinguely sculptures. This was our best meal in Stockholm. We strongly recommend this place. Attentive staff, knowledgeable and passionate about food, and, of course, the food was exceptional. Can you tell we liked this place? We visited this café five mornings in a row and always walked away happy. We had a beautiful hotel breakfast (@ NOFO a few blocks north) and still made a stop here to sample the baked goods and coffee. The folks were really nice and it was a perfect way to start the day. There is a relaxing vibe sitting out front looking on to the adjacent park. Yes, it’s a huge red-brick building (nearly 8 million) with an impossibly large tower that looks old, but is it? No, not really. It was built between 1911 and 1923. 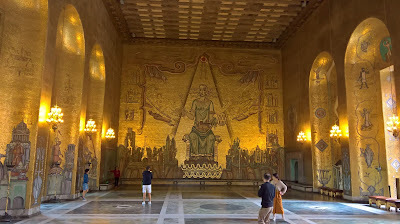 Nevertheless, it is an impressive building and where the Nobel banquet is held. You visit on a tour. The tower is a separate, timed-entrance. 30 minutes to buy a baby blanket for a gift for some friends. Back to City Hall for quick lunch and to climb the tower. Airport bus to Stockholm Skavsta Flygplats. Ryanair flies out of the most inconvenient locations…oh yeah that's why it's low cost. Left: GPS tracks for Clusone - Parafulmine - Colzate hike. Right: On the path to Pizzo Formico. Left: Panorama from Monte Formico looking north toward Clusone. Right: View of the pasture from Rifugio Parafulmine toward Monte Formico. 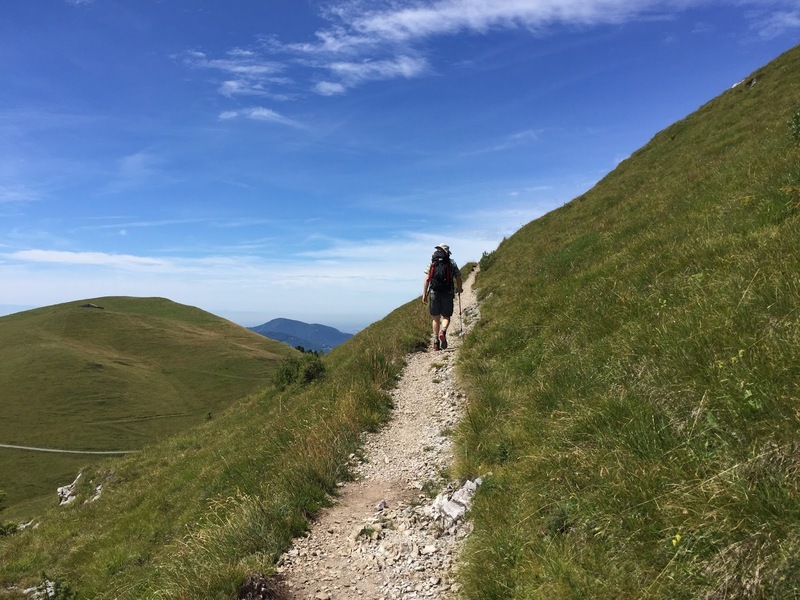 For a description of the more typical way to hike Parafulmine, see Monte Farno, Pizzo Formico, Rifugio Parafulmine and Back. 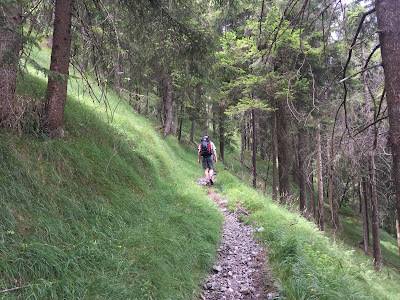 To get to the start of this hike, we took the Linea S bus from Bergamo Terminal SAB (near train station) heading to Clusone, in the Val Seriana. The bus route major stops are Bergamo, Alzano, Nembro, Albino, Comenduno, Gazzaniga, Clusone, and Bratto. 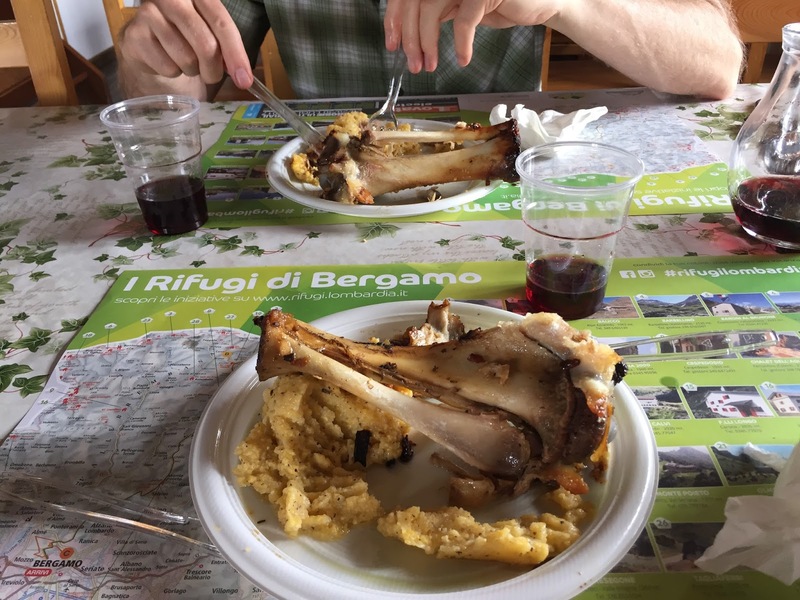 You can find the bus schedules at www.bergamotrasporti.it. We got off at Fiorine - s.p. 35 (Bar Lanterna) before the bus entered Clusone. At the end of the hike, we caught Linea S as it passed through Colzate heading back to Bergamo. 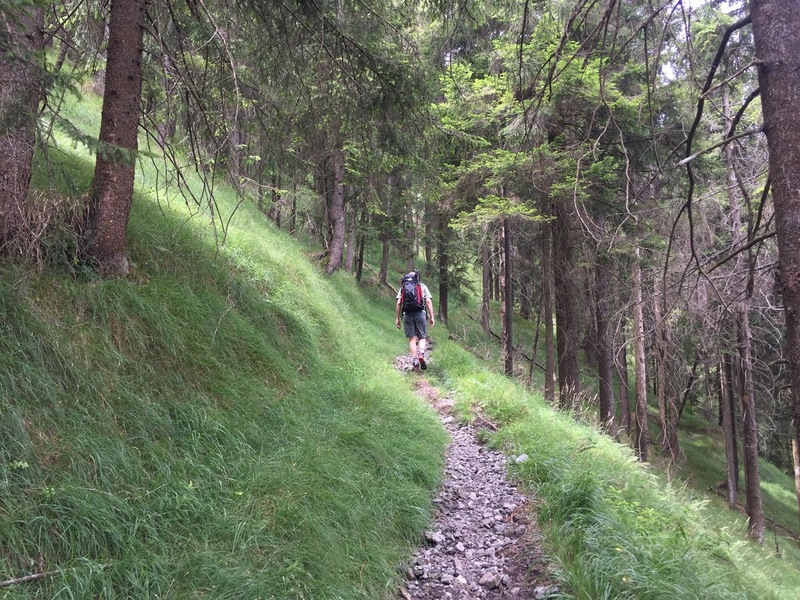 We took this hike as a practice run with new backpacks we are planning to use on an upcoming 5 days rifugio-to-rifugio hike. The new packs are larger (~ 50 L) than our normal day packs (~ 25 L). We loaded up the new packs with all sorts of stuff we didn’t need today to get to about 20 – 25 lbs. Today, we decided to shave off a little distance and time by starting on a trail called Mulattiera Fontanile di Sales that runs parallel to 508, but avoids going through Clusone and the surrounding area. In the end, I’m not sure we succeeded because we got lost a few times due to a few unsigned forks in the path. 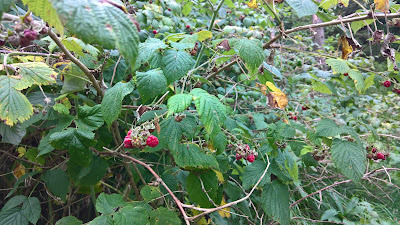 On the plus side, we munched on some nice raspberries along the path. 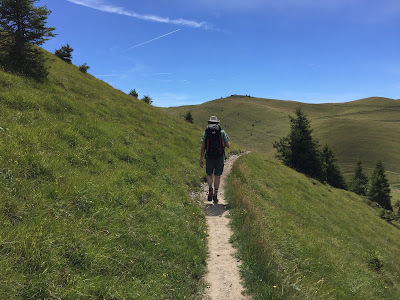 After a few kilometers on the mulattiera (mule track), loaded with more weight than normal and a bit grouchy because of it, we came upon a clearing with a fork in the trail. Choose right and we go by a house with angry guard dachshunds. Choose left and we follow a trail that seemed to descend to nowhere. We called out to a young girl who came out to call off the dogs. She wasn’t sure what we were asking and went to get her aunt who was able to guide us. 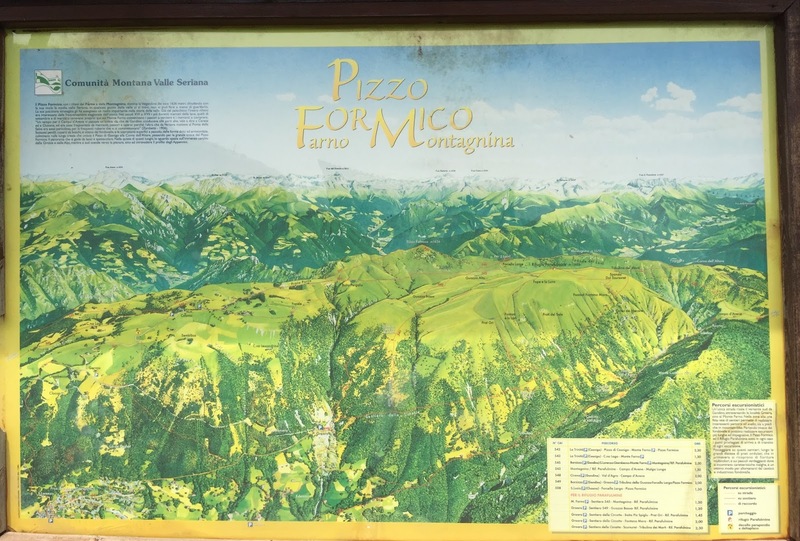 Aside: That brings me to forks in trails in Italy, specifically, a fork in the trail when you reach a clearing where there is a building (house, barn, or whatever) and it's clearly someone’s property. You would think that taking the fork that doesn’t lead to the building would be the smartest choice, but that’s not always the case. Sometimes, the trail goes right by the building and sometimes it doesn't. And sometimes, like on today’s hike with the guard dachshunds, both forks end up in the same place. 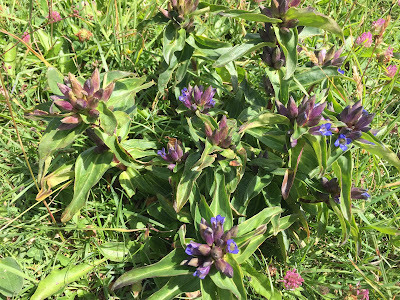 It was a relief to finally meet up with Sentiero 508 and shortly thereafter reach Forcella Larga, a saddle where several paths meet. From the saddle, you are looking south over Conca della Montagnina, the upper part of Val Gandino, which is a lateral valley of Val Seriana. 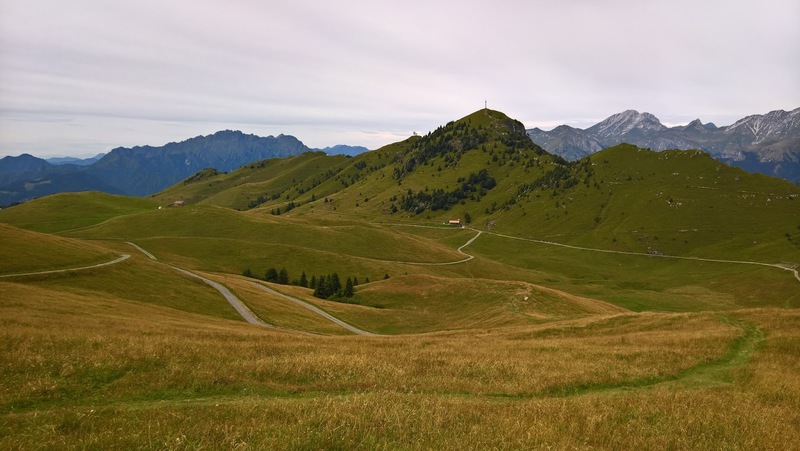 From the saddle, you can see Pizzo Formico and Parafulmine. Below in the pastures cows lounged around a water hole, some standing in the water keeping cool. The sound of their bells filled the air. 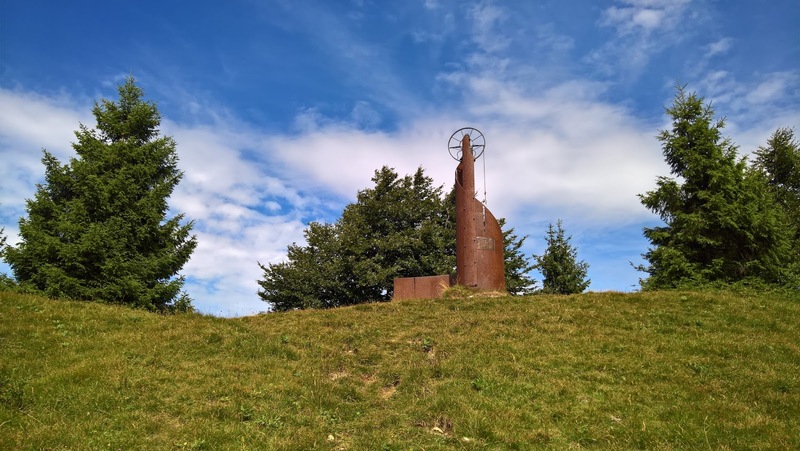 Speaking of bells, nearby the Forcella Larga, you can find Campana del CAI di Clusone, an interesting sculpture with a bell. 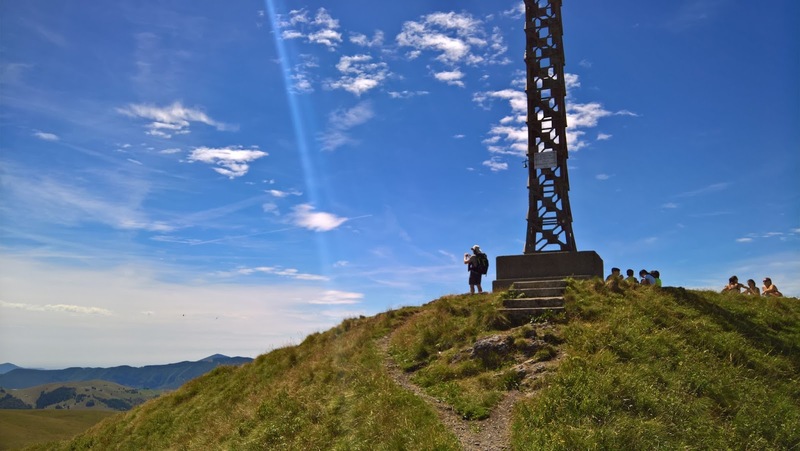 From Forcella Larga, we decided to check out Pizzo Formico (1636 m), which provides quite the view of the Bergamasque Alps and Prealps. 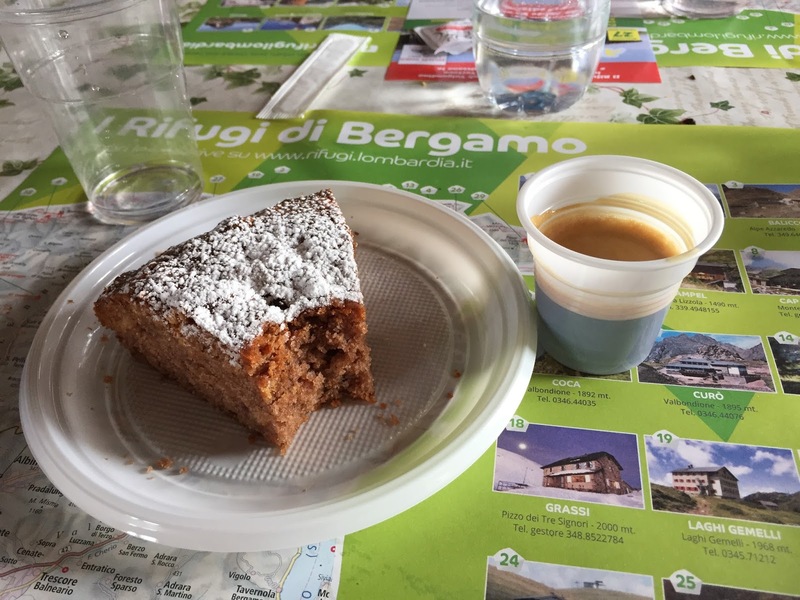 After a look around on Formico, we headed back down to Rifugio Parafulmine (1536 m) for lunch. As usual, we planned our hike around lunch and were eagerly anticipating what would be on the menu. 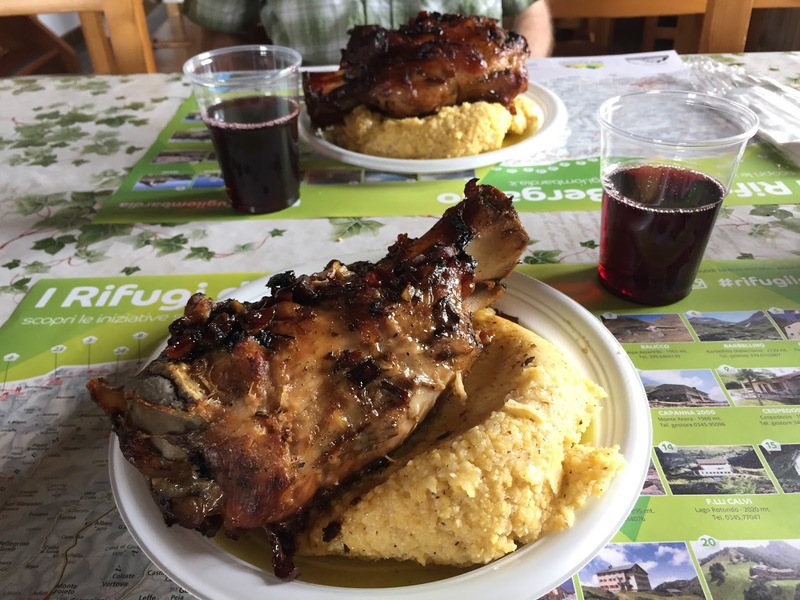 We are happy to report we were presented with stinco al forno (slow-roasted pork shank), polenta, and wine. All the huffing and puffing of the previous 4 hours was soon forgotten. Stinco al forno at Rifugio Parafulmine before and after photo, plus dessert and coffee. 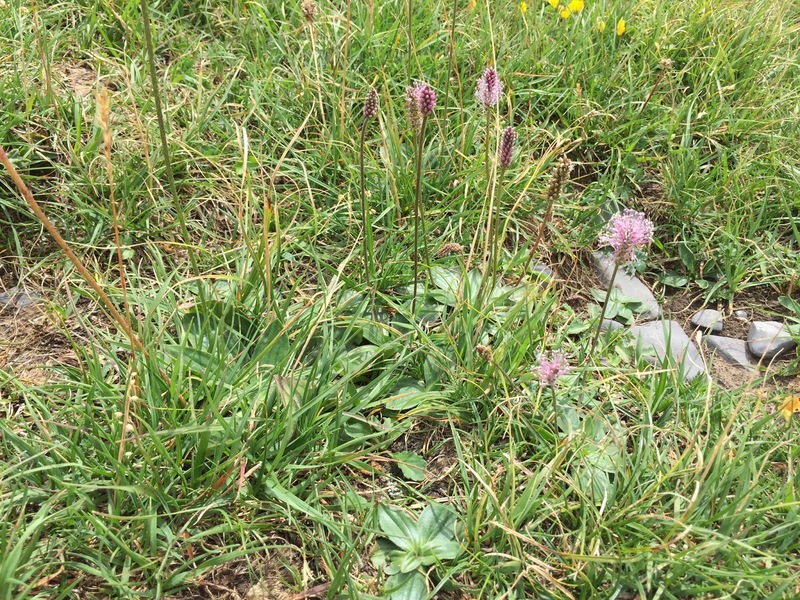 Not too bad for mountain food. Parafulmine is the Italian word for “lightening rod”. Other ways to get to Rifugio Parafulmine include Sentiero 549 from Barzizza (Grandino) and Sentiero 543 from Casnigo (SS. Trinità). 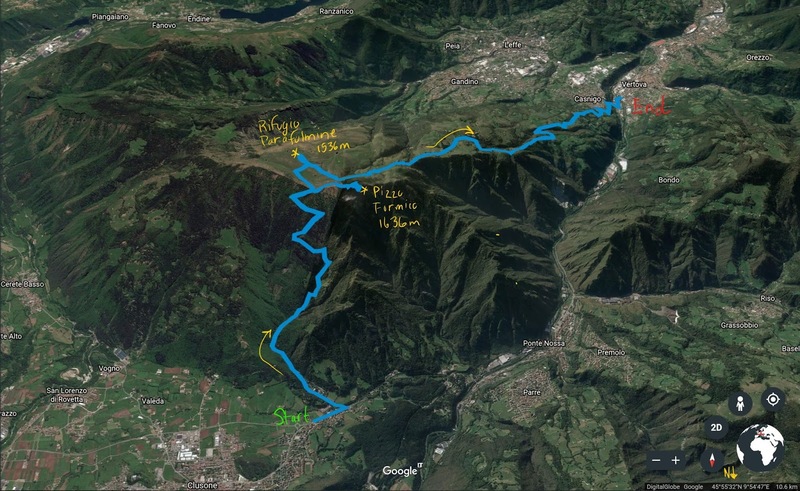 Another possible walking opportunity in the area is the route called Traversata tra i Pizzi (brochure), which takes you through a loop of Val Gandino. 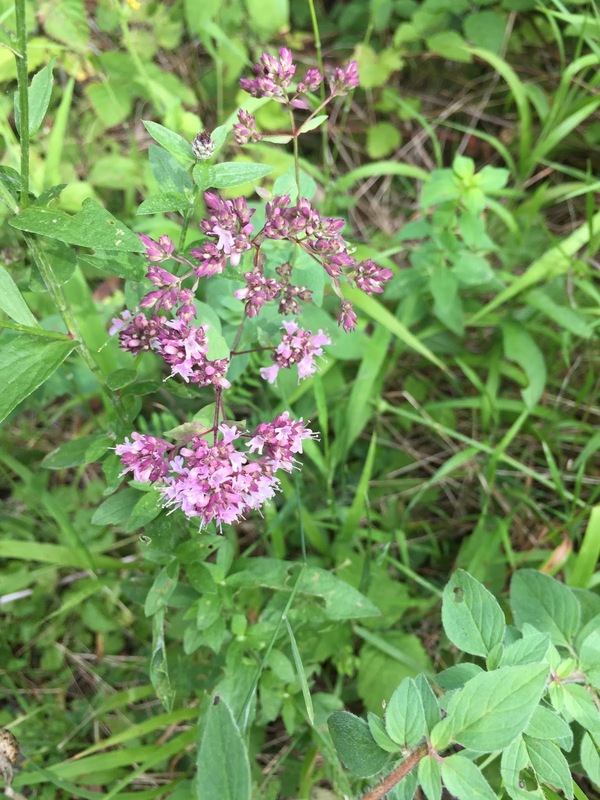 Left: [Lamiaceae] Origanum vulgare – Oregano (Origano comune). 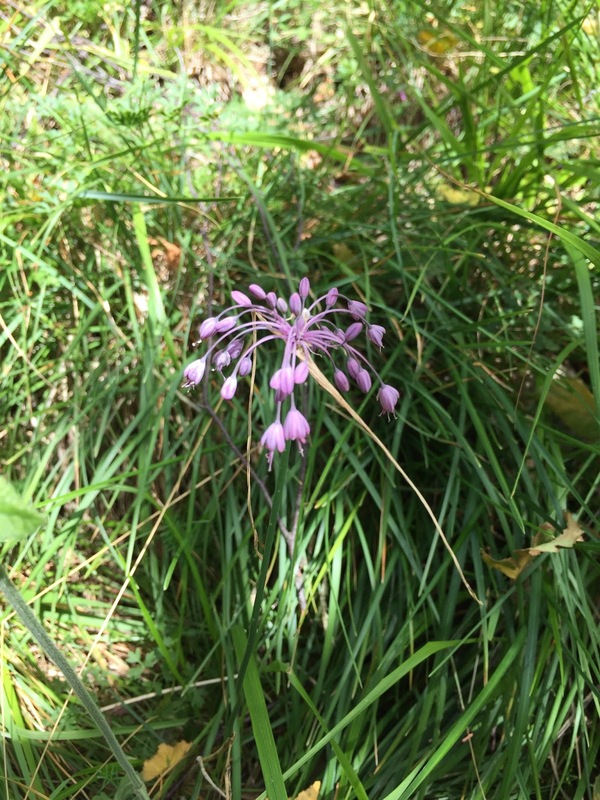 Center: [Liliaceae] Allium carinatum – Keeled Garlic (Aglio carenato). 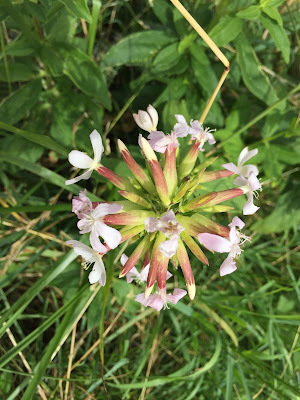 Right: [Caryophyllaceae] Saponaria officinalis – Bouncingbet, Common Soapwort (Saponaria comune). 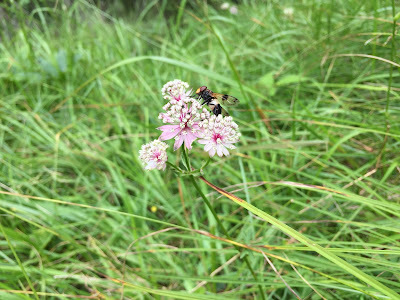 Left: [Apiaceae] Astrantia major – Great Masterwort (Astranzia maggiore). Center: [Gentianaceae] Gentiana cruciate – Cross or Star Gentian (Genziana con foglie disposte a croce). 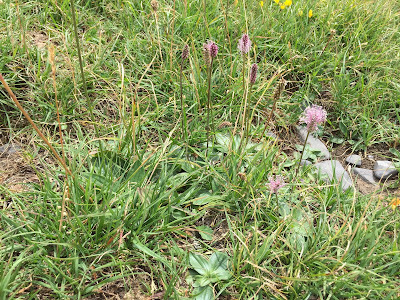 Right: [Plantaginaceae] Plantago media – Hoary Plantain (Piantaggine media). 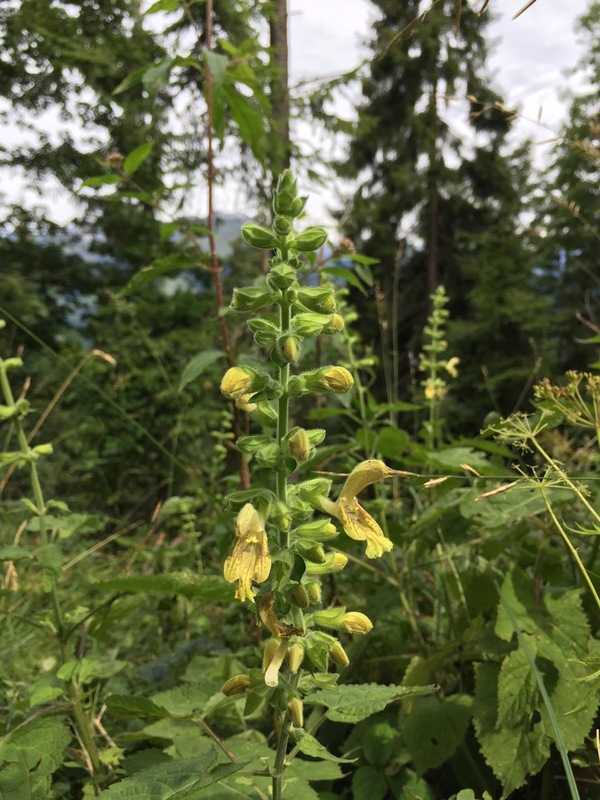 Left: [Orobanchaceae] Rhinanthus alectorolophus – Greater Yellow Rattle (Cresta di gallo comune). Center: [Lamiaceae] Salvia glutinosa – Sticky Sage (Salvia vischiosa). 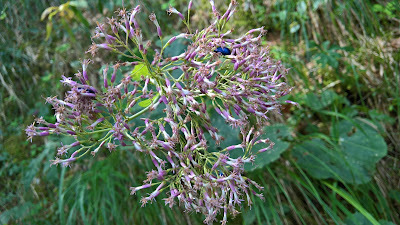 Right: [Asteraceae] Adenostyles alpina – (Cavolaccio alpino) with blue beetles Oreina genus. 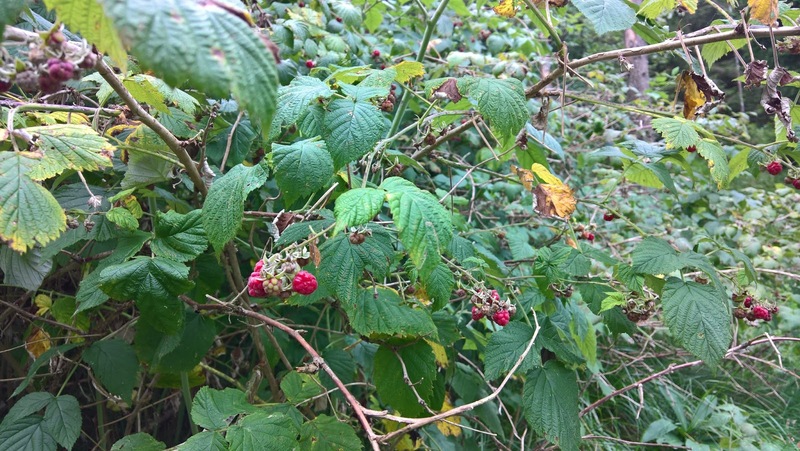 [Rosaceae] Rubus idaeus – Red Raspberry (Lampone). Left: Another view of the GPS tracks for the hike from Clusone to Parafulmine. Right: A sign at Rifugio Parafulmine describing the area Pizzo Formico, Pizzo Farno, and Pizzo Montagnina. 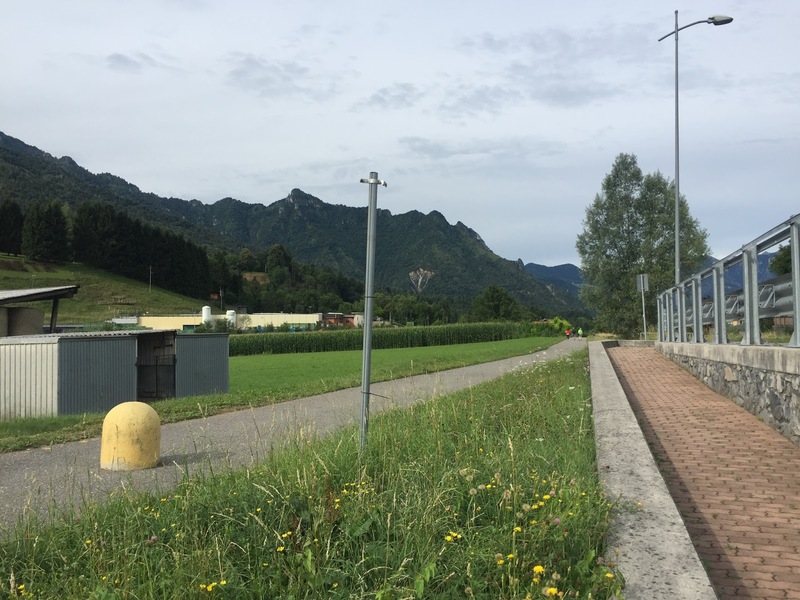 Left: Start of the hike alongside SP ex Strada Statale 671 in Fiorine. Center: On Senterio 508 just below Forcella Larga. 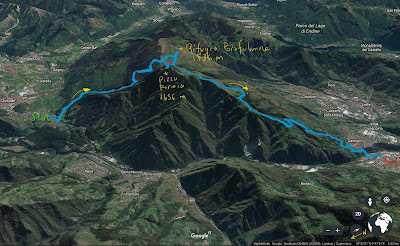 Right: Near Forcella Larga and heading to Parafulime, visible on the peak. Left: The bell-sculpture, Campana del CAI di Clusone, near Forcella Larga. Right: Pizzo Formico with people having a picnic.